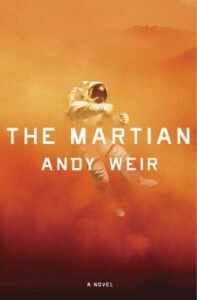 Everyone has been raving about The Martian by Andy Weir, and as a total sucker for any space exploration related story, I had to read it. The Martian is about Mark Watney, a member of one of the first human Mars exploration teams. When the mission is aborted due to a dust storm, he has an accident and is presumed dead while the rest of the team evacuates. But Mark is not dead, and as the mission’s mechanical engineer, he’s uniquely qualified to survive in a place where his continued life depends on machines working. When I started this book, I was a bit skeptical about all the praise it had been getting – how could one guy all alone on a planet be that interesting? Weir does an admirable job, though – Mark is determined, optimistic, has a great (and sometimes very immature) sense of humour, and he’s everything you dreamed you’d be when you dreamed of being an astronaut when you were younger (if you didn’t want to be an astronaut, what the hell?) He’s also the quintessential engineer, he doesn’t mope when there are problems unsolved. It’s brilliant to hear all the scientific issues he faces from his voice; his enthusiasm is infectious, and what could have been easily tedious instead becomes thrilling. Mark isn’t the only character though, we also follow the action back on Earth, and Mark’s mission crew that are back on their way from Mars trying to live with the guilt of leaving a man behind. The point of view jumps around a lot, but I think that’s only fitting in a story about humanity banding together and trying to save one man. There are a couple of scenes on Mars that are told in an omniscient narrative style, and those do stick out a bit, but they’re rare. So yes, I loved this book as much as everyone else. It seems like everything these days talks about humanity’s flaws, but this book makes me really proud to be a human. Also… the pacing of the book was very much like that of a movie, and I really wanted it to see a movie version (Gravity and Apollo 13 are both really great movies of this type, although those take place over a few days at most). Apparently Ridley Scott feels the same way, because The Martian is coming out this November! And what a great cast, too – Matt Damon, Jessica Chastain, Sean Bean, Jeff Daniels, Donald Glover, Kate Mara, Sebastian Stan, Chiwetel Ejiofor, Michael Peña – all people I like. I’m a bit puzzled by Chiwetel Ejiofor playing an Indian person, but he’s a great actor, so I’m not actually complaining. Ok, I’m convinced I need to read it. :) I’ve been out of everything related to books for months now so I missed this. But it sounds good the way you described it.